Does your company target other businesses? 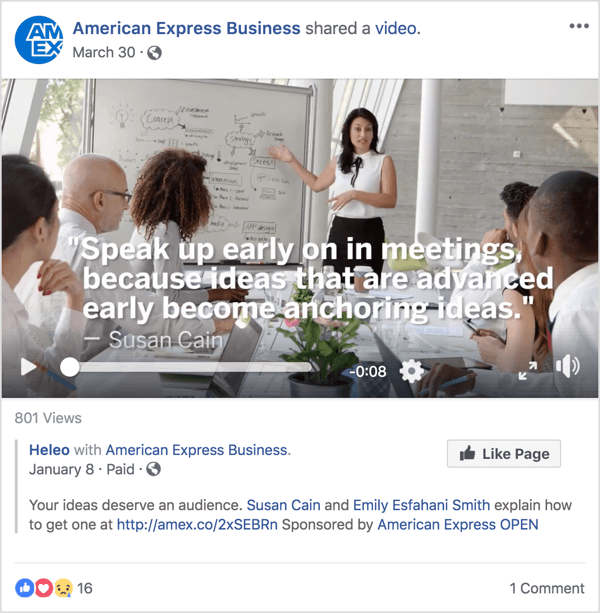 Wondering how to use Facebook ads to connect with prospects? In this article, you’ll find four ways to use Facebook ads to reach B2B customers. 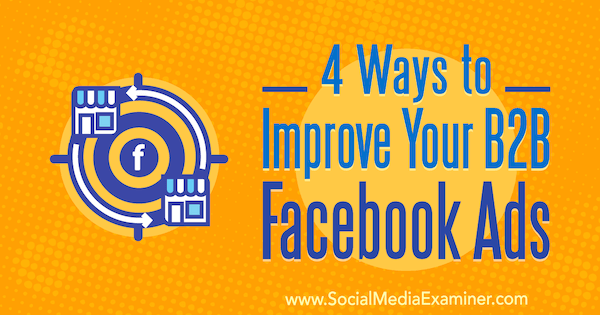 4 Ways to Improve Your B2B Facebook Ads by Peter Dulay on Social Media Examiner. More than likely, you already have a good idea whom your target audience is. 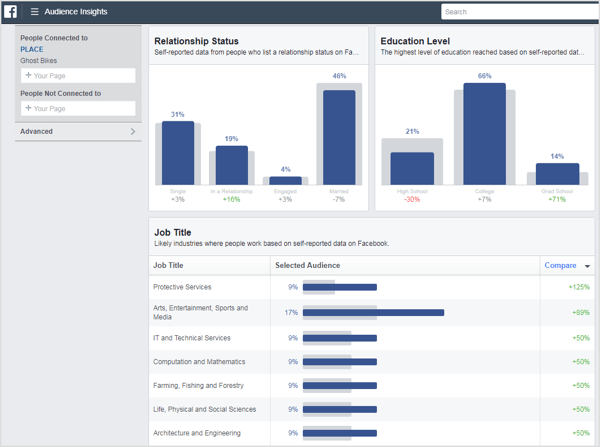 However, Facebook’s Audience Insights tool can reveal some additional details about your audience on Facebook. 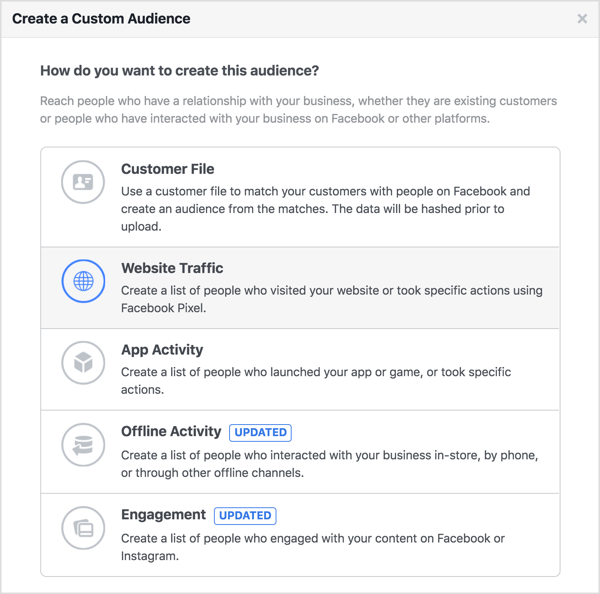 While most analytics tools focus on basic follower demographics (age, gender, location), Facebook Audience Insights provides a comprehensive view of more personal statistics such as relationship status, education level, and so on. For B2B audiences, look at helpful insights like job title. 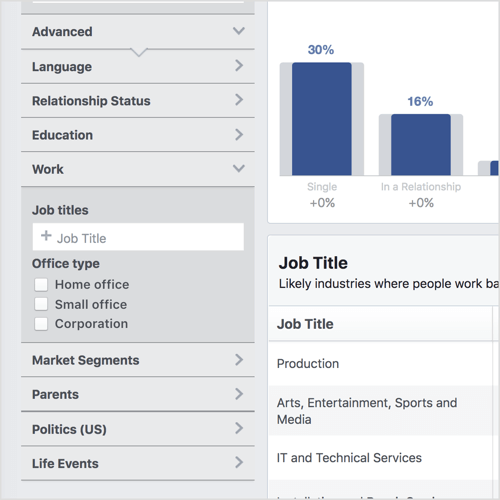 On the Demographics tab, you can see the professions of your Facebook page’s followers and find out the percentage of followers in each field/industry. Assessing the job title of your followers lets you see what kinds of businesses primarily engage with your page and content. From here, compile a list of job titles that deliver the highest level of engagement/impressions, along with the job titles you wish to gain more traction from. You can also click Advanced in the left column to reveal additional categories such as Life Events (where you can narrow the data by the New Job life event) and Office Type (where you can refine the data to the large office, small office, or home office workers that make up your followers). Now use this data to create a Facebook audience. To do this, open the Audiences dashboard in Ads Manager. Click Create Audience and select Saved Audience from the drop-down menu. 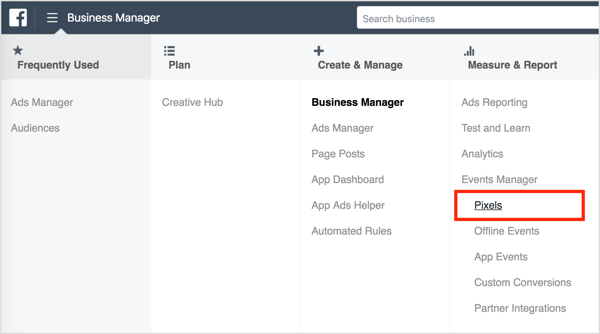 In the Create a Saved Audience window, scroll down to the Detailed Targeting section and begin typing in the job titles, behaviors, interests, or life events you want to target based on your insights. Facebook will auto-generate related suggestions to these audiences that you may find useful. Retargeting is a crucial step to securing your B2B leads via ad campaigns. To set up a Facebook retargeting campaign, you need to install the Facebook pixel on your website. This code lets you track visitors and conversions to your site from Facebook. To get the code, open Business Manager and select Pixels. From there, click Create a Pixel and follow the prompts to copy the pixel code. Then paste the code in the header section for your website or ask your web developer to do this. After you install the pixel, you can create a custom audience of your website traffic. Begin your retargeting efforts by creating an ad campaign that targets your website traffic custom audience. 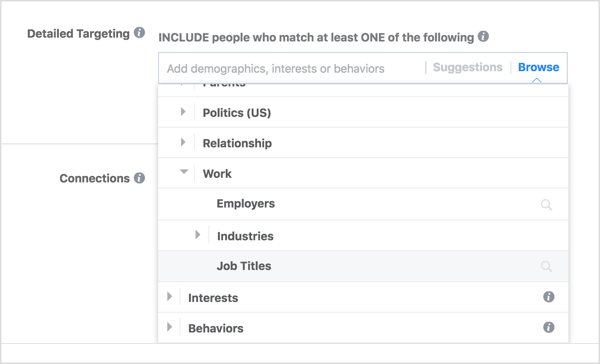 To ensure your retargeting ads reach your B2B audience, filter your audience by the previously determined job titles you want to target under the Detailed Targeting section. Using this tactic, you can entice your target audience by offering additional resources. Facebook retargeting turns warm leads into hot ones and allows you to craft more specific messaging with incentives like free trials, promotions, and more. Designing a visually appealing ad is the key to attracting anyone’s attention, but certain designs/graphics are more effective for B2B ads. While B2C ads tend to be light, airy, casual, and often feature pictures of people, B2B ads need to project sophistication and authority. B2C ads are oriented toward entertaining content, while B2B ads are aimed at providing informative content. When it comes to the visual elements for B2B ads, there are three things to remember: dark backgrounds with light text evoke the most power, charts/graphics generate a higher click-through rate, and sans-serif fonts perform better. Aesthetics aren’t the only important factor, however. Make sure you also craft a thought-provoking message and include an enticing call to action. The messaging in the Hootsuite ad above is clear-cut and concise. 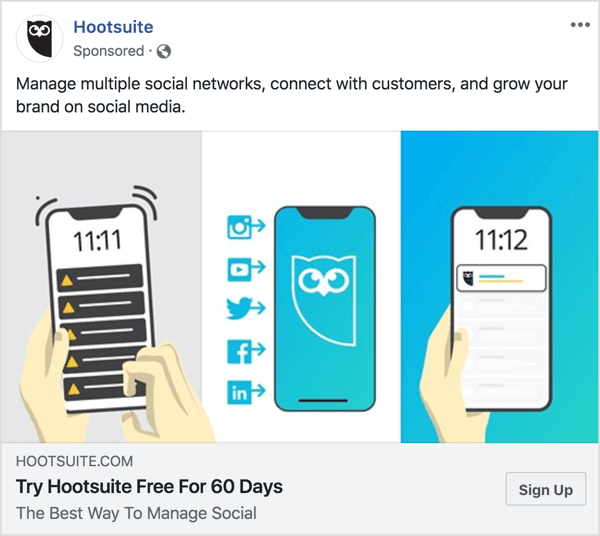 The ad briefly states the services the tool offers (“manage social media networks, connect with customers, and grow your brand”), while simultaneously offering a tempting call to action. It gets straight to the point. The ad is action-oriented and goal-specific, veering away from the vague Learn More calls to action you normally see among B2C ads. Instead, it urges its viewers to Sign Up, an action that evokes a deeper commitment and signals long-term investment, as is usually the case with B2B transactions. Influencer marketing broadens your reach and credibility by introducing your product/service to the influencer’s audience. And if the influencer is a trusted authority within that industry, your results will be even better. Partnering with influencers and thought leaders who are well-known in your industry is an invaluable strategy. Businesses want to see that well-known professionals stand behind your product/service. 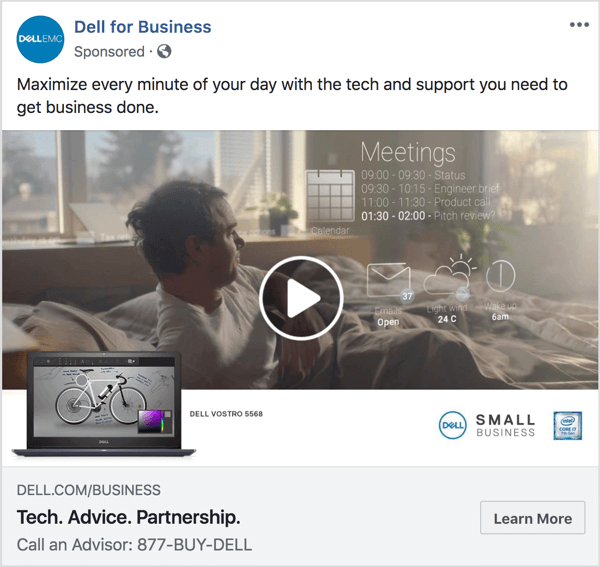 Beyond featuring influencers and thought leaders in your Facebook ads, you might also consider asking them to create their own content sponsoring your product. While some public figures may be out of reach for smaller businesses, there are influencers of every caliber. Find influencers with a following comparable to yours, and when you contact them, share what you admire about their work. You can also get your foot in the door by mentioning them or sharing some of their content with your followers. After you develop a relationship, make your pitch. Highlight what your business has to offer and why you think that influencer would be a valuable asset in spreading the word. Also look for businesses in shoulder industries (with similar sizes and goals to yours) and form partnerships with them for mutual endorsements. While finding influencers on Facebook currently requires extensive research and a well-honed pitch, the Brand Collabs Manager might be able to help. This tool allows brands and creators to define their niche/industry so they can easily find and contact each other for partnerships and sponsorships. It’s currently available only to some brands, but you can sign up for the waitlist. All B2B brands can benefit from a consistent brand persona. For example, a fun and playful brand persona can range from sarcastic or quick-witted to enthusiastic and excitable (think lots of exclamation points, GIFs, and smileys). Other B2Bs do well with a more subtle or straightforward approach. Once you define your brand voice, use it to respond to your commenters on Facebook. Show them that you’re listening to the conversation. The key is to make others feel like they’re communicating on a personal level with your business. Many B2B marketers think humanizing a business is only relevant for B2C marketing. However, business customers want to know that they’re investing their time and money into a B2B that shares their outlook, values, and overall personality. Salesforce is widely lauded for their effective B2B marketing strategies and distinctive brand personality. 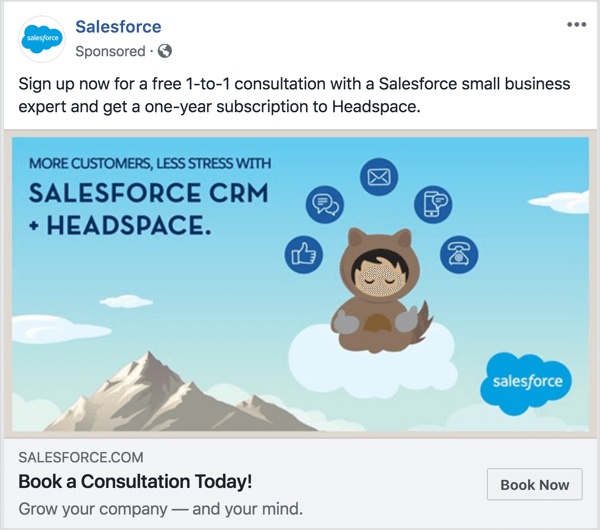 In the ad below, the “Grow your company — and your mind” catchphrase immediately draws readers in because work is stressful and everyone is looking for relief. The personal touch is further emphasized by the free 1-year subscription to the meditation app Headspace. The biggest mistake that B2B marketers make is sending their message out into the world and then paying it no mind. Consider the voice/persona you want your brand to embody. 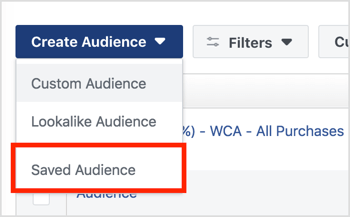 Click here to learn how to use workplace targeting to serve Facebook ads to people who work at specific companies. What do you think? Do you use some of these tactics for your B2B campaigns? What tips can you offer? Please share your thoughts in the comments below.